Beyer’s Design Inc. was founded by Anita Beyer to create and implement the décor of individual residences and offices to reflect the taste of the person, family or business. When the company was officially formed in January of 2002, Anita’s lifelong vision came to fruition. Today she joyfully engages in all aspects of the multi-dimensional business of interior design. Blessed with an innate interior decorating talent and equipped with a strong customer service background, Anita orchestrates projects effortlessly for her clients. She is an artist and a savvy buyer wrapped into one. Choosing colors, textures, furniture, accessories, rugs and more to reflect her client’s desires are among her favorite things to do. Anita hires from a select group of professional vendors and subcontractors and oversees every project from start to finish. She communicates with her clients every step of the way - making sure everything is moving along as expected. 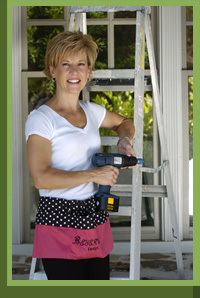 And, if you’re wondering…Yes, she actually does use her pink tool belt! Anita is skilled in everything from light electrical work, faux finishing, sewing, designing cabinetry, using power tools, and more (but she leaves the hard-hat labor to others now). Prior to forming Beyer’s Design, Anita was the Customer Service Manager of an international chemical company where she engineered a specialized software system for the company and restructured the Customer Service Department to streamline hiring and training of staff members. So being in the project-oriented, home improvement business with a pink tool belt isn’t too far off for her. Anita keeps active within her industry by attending seminars and furniture markets to keep up-to-date with what’s new in design and function, as well as continued education classes. She is on the Board of the Atlanta Designer Network and an active member of the Interior Design Society and the International Furniture Design Association.